Office Max’s golden yellow halo is a focal element in this big box store that grabs the customer’s attention, draws her into the store, and acts as an organizing element within the Box. Smaller halos, in a hierarchical fashion and neutral color are positioned at the perimeter of the store announcing tertiary departments. But it’s the color palette that really works hard in this design. The golden-yellow halo plays off the tangerine orange back wall which in turn is framed by neutral beige side walls. Small details have a big impact including accent colors which peek through the merchandise displayed on the gondolas. The color palette is sophisticated, layered, and creates depth. 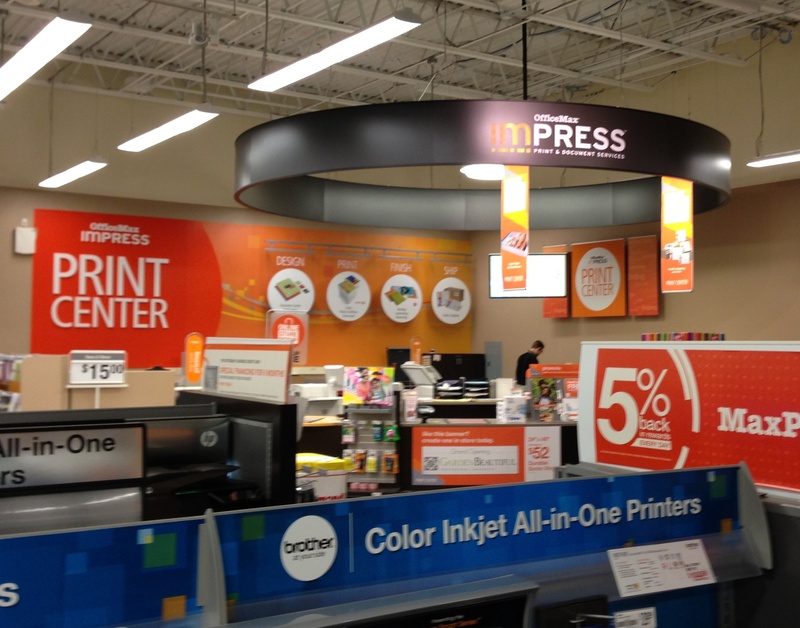 Instead of only bold accents and vanilla walls like many big boxes, Office Max’s color palette is calming, and making the shopping experience easier. Part of the calmness of the store is the lighting which complements the color palette. Finally, a big box that gets it – yes there are other fixtures in the universe besides the ubiquitous high-bay, with their ribbed acrylic dome lens and off-color greenish/ grey lights. 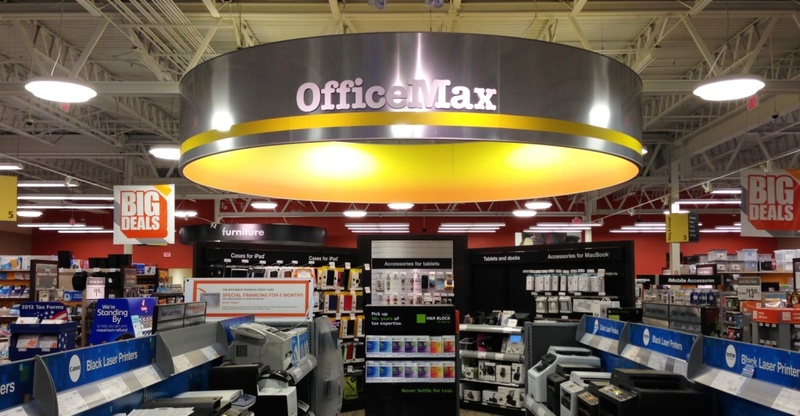 Office Max uses floating orb fluorescents in the focal areas and linear lighting, hung at the correct height, for the remainder of the store. The Bottom Line: Compared to Best Buy which has no overriding design theme for the store, besides blue graphics and vanilla walls, Office Max’s approach uses a harmonizing polychromatic color palette, effective lighting and compelling super graphics, to unify the store design making it easier to navigate and shop in than Best Buy’s. Next The Original Idea Lab!